The watch arrived on time. The instructions are clear and concise. It does what is says on the can it tells the time and gives me the date. It is comfortable to wear. So overall I am pleased with my purchase. One criticism the manufacturer states that it water resistant to 30 m and then says it is only splash proof not suitable for swimming. I find this strange as I am scuba diver. The watch is exactly what I wanted. It is elegant and looks more than its price. It is clear to read and accurate. It was delivered well packaged and on time. Thank you. I bought this product as a gift for my dad. I have discovered that Seconda is a very reliable and cheap watch. The value id mire than what you pay for . I have had mine for about 3 years now with no problems whatsoever. Its the second Seconda Om buying for my dad too. I strongly recommend this watch for its value for money and amazing simplicity. I am very pleased with my purchase, the delivery was excellant and the watched was just what I had been searching for, as I am suffer from Macular Degeneration in one eye. Also the bonus was BOTH day and date. This was a eplacement for Timex which battery gave up after 5 years. Bought this as my Timex didnt have date & time, which this watch has. Was delivered exceptionally quickly after ordering online. Nice case, cheap looking face, hour, minute & second hand poor & winder doesnt feel like it will last 2 minutes! The watch was bought as a gift for an elderly man. He was very pleased with the quality, the size of the numerals and day/date display he has poor eyesight and the strap which we were able to adjust easily as he is very frail. All in all a good buy. We would recommend Watch Shop before you buy elsewhere. Your website and order process were very easy to use and delivery was fairly prompt, albeit a day later than promised. 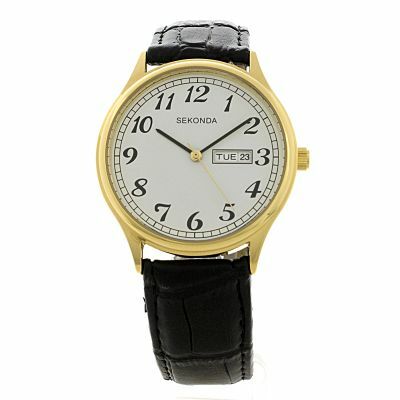 Following the recent purchaseof my Sekonda wrist watch and even included in the high value in the price in money.The look is just amazing and it has a time and date wing which is white but can be very emotional like everybodyelses wrists watch.Added to which it comes just with a leather strap similar to school age as previously. had many secondas over the years and this one is as good as all the others have been. particularly like the clear face and the day/date display. The watch is exactly as it appears on the site, especially in the 3D view. The dial is very clear, though the needles could be a bit more prominent to match the clarity of dial numbers. It is a real value for money for people who like simple classic watches. Bought this for my husband and we are both very pleased with this item. Nice clear numerals (especially for men of his age) nice comfy strap.